ChorSymphonica is a classical music ensemble dedicated to Music That Matters. Based in Rockville, MD, a suburb of Washington, DC, we are a professional choral-orchestral ensemble supported by grants from The Arts and Humanities Council of Montgomery County. Additional support comes from private foundations, including the Paul M. Angell Family Foundation, as well as gifts from the general public, and the 19/19/19 Campaign. ​Founded in 2011 by conductor Richard Allen Roe, the group first took the name The Advent Project, owing to the Advent repertoire performed on their first concert. 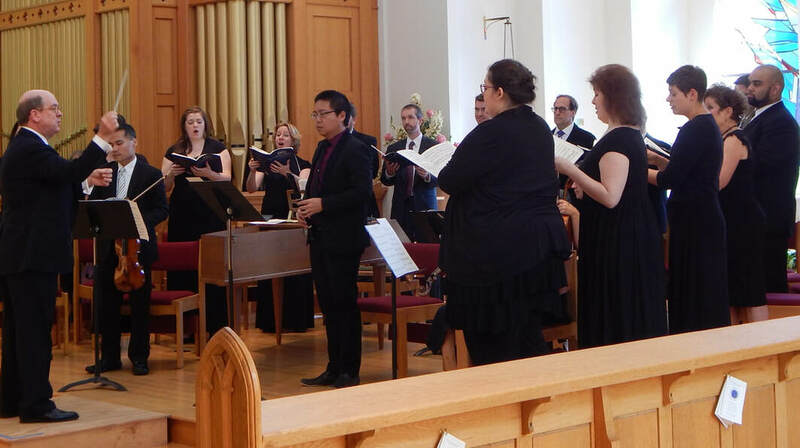 The group has since explored a wide range of repertoire, from Renaissance to Romantic era a cappella music, with a strong emphasis on the cantatas of Johann Sebastian Bach. Along with their concert performances, we have developed a unique concert experience, called Conversation Concerts. We continue to produce these educational and musical events along with traditional (non-lecture) concerts, and hope you will join us for our next performance. ChorSymphonica is a professional, project-based ensemble of musicians drawn from across the Mid-Atlantic region and beyond, with the goal of making Music That Matters. Nearly all of our musicians have earned graduate degrees in vocal performance. Every one of our members are dedicated to using their artistic life to improve the lives of others, to inspire others to a more complete point of view, reaching out to audiences with our music making through our concerts. This purpose guides and directs every rehearsal and every concert. ChorSymphonica is a project-based ensemble. We don’t meet on a regular basis for rehearsals, but come together for brief, intense work periods (“projects”), which culminate in performances. Musicians self-select for projects, depending on their own availability. In this way we can draw upon the range of qualified musicians throughout the region for our concerts. Auditions are held periodically for membership in our database of singers, and for solo opportunities. Soloists are drawn from the ranks of the chorus. Our music reaches people on a personal level, brings them to contemplation. We are the House Ensemble of The Rockville Bach Academy, Inc, a non-profit organization chartered in Maryland.